30-Day Money Back Guarantee. 100% Satisfied. 30 day free trial is available. 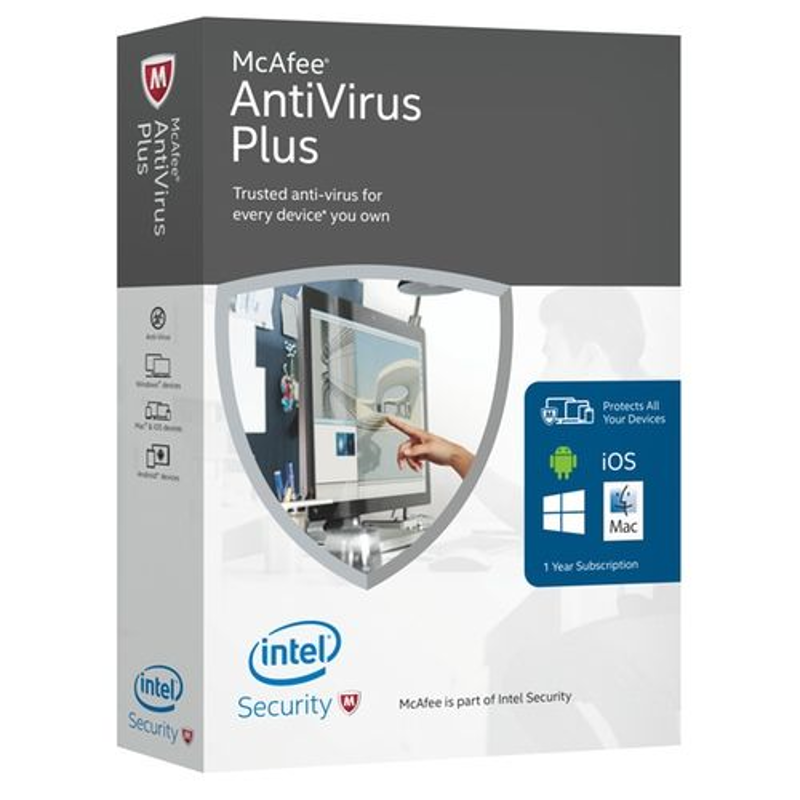 McAfee AntiVirus Plus by Intel Security is a popular solution for protecting your devices from malware and viruses. McAfee is one of the oldest (and largest) names in computer security and has been protecting computers since 1987. The real-time antivirus protection software which McAfee offers has been optimized to be fast, easy on your computer and phone resources, and has the ability to detect the most recent virus's, spyware and trojans found online. A simple firewall (similar to the one which comes with Windows) that can block attacks on your computer from the internet. This traffic controller has 4 modes which are: Smart Access, Monitored Access, Stealth, and Lockdown. 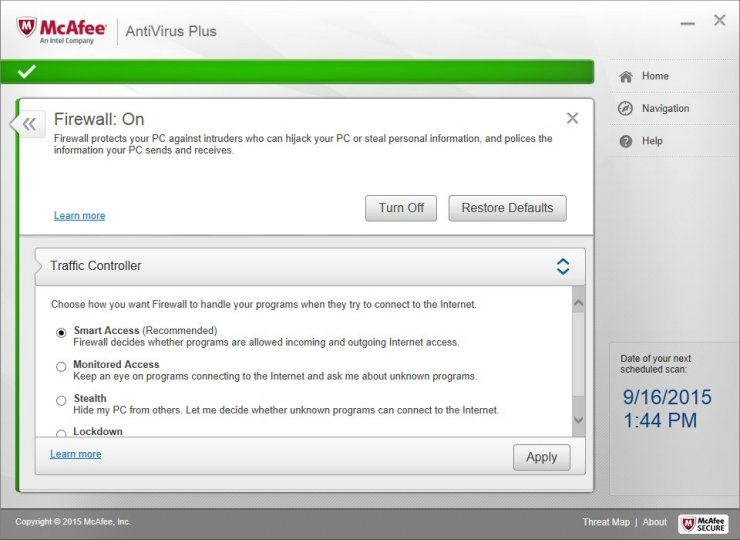 The default install of McAfee AntiVirus Plus enables the Simple Firewall in Smart Access mode which gives the firewall the decision making process to determine which programs are allowed incoming and/or outgoing internet access. This setting is fine for most users. On most PC setups when you delete a file, it is actually sent to the Recycle Bin. When it is located here it can be undeleted if needed. The thing is even when you empty the Recycle Bin, the only thing which gets deleted is the location information of the file. The actual information of the file remains on the hard drive until the space is used up by some other file. This means that the file can be retrieved by someone who understands how files are stored. With McAfee's Shredder it lets you securely delete sensitive files by overwriting the files several times, preventing any kind of forensic recovery. For Android and iOS devices McAfee AntiVirus comes with anti-theft protection which includes remote locate, lock, and wipe, as well as the ability to sound a loud alarm. You can turn continuous tracking on at the expense of battery life which will map out the location of your missing device. 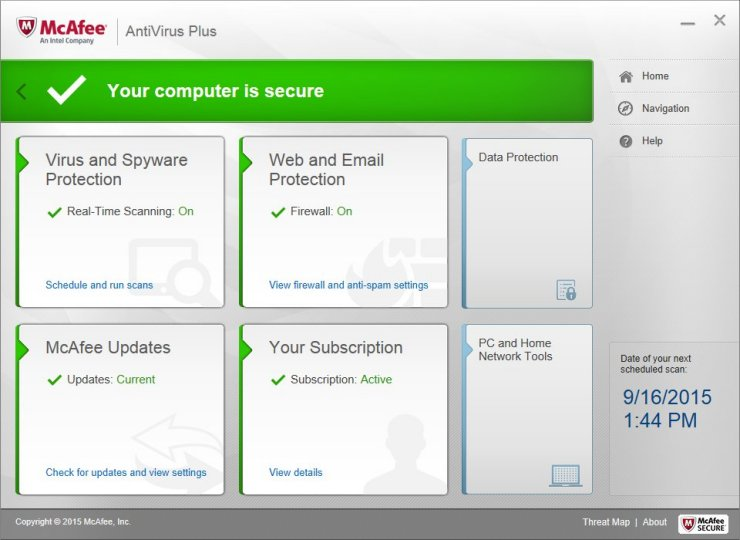 You manage these features through McAfee's online portal where you manage your subscription. 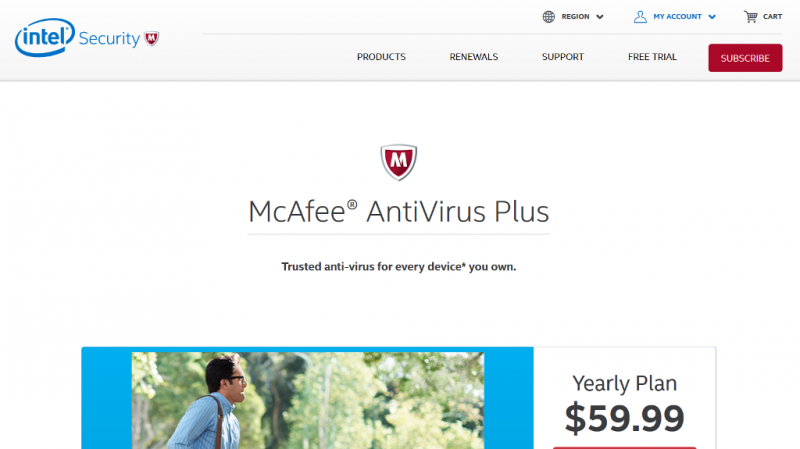 McAfee AntiVirus Plus subscription costs $59.99 per year. The subscription automatically renews unless disabled. Since this anti-virus software supports Windows, Mac, iOS and Android with unlimited installs this makes it ideal for someone with a lot of devices. You can also install this software to protect all of your family devices which increases the savings. McAfee also offers Security experts which are available 24x7 to eliminate viruses, spyware, rootkits and other malware from your PC. This service costs $89.95 and is backed by a 30 day money back guarantee. This service is delivered remotely by your internet connection. The customer support website of McAfee has lots of information on the latest viruses found including a global virus map showing a threat meter for each country. They also have a FAQ with common security related questions about the internet in general and their products. You will also find the McAfee Security Advice Center which has blog posts from leading security experts along with a community forum which allows you to post your own questions and help to find solutions for other peoples problems. 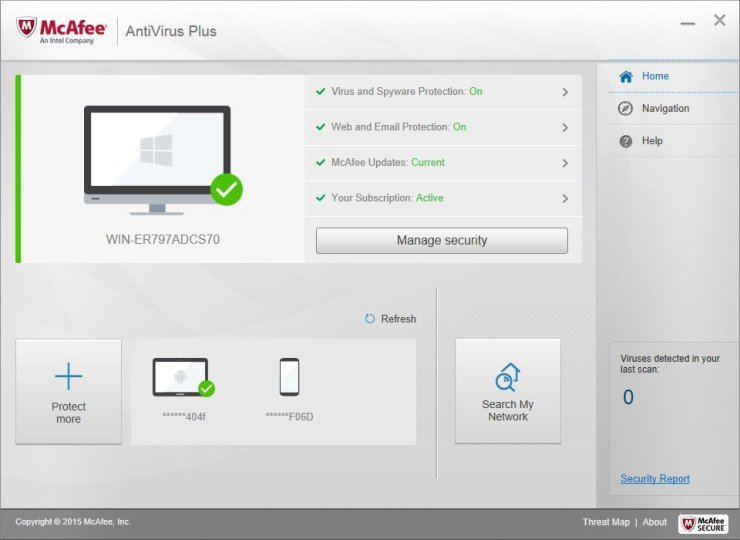 McAfee AntiVirus Plus offers all around good protection of your files and needs very little in computer resources when protecting your device. Once you purchase a subscription you can also protect an unlimited number of devices with one subscription which is excellent. Files downloaded from the internet are automatically scanned and anyone attempting to look for open ports on your computer will be stopped by the included McAfee firewall service. While the firewall may be called "Simple" by McAfee it does the job well as most people do not need a firewall with many configurable options since the default settings suits 95% of users fine. For Microsoft users though Windows has been including a firewall service for a while now which is perfectly suited at protecting most PCs so I am not sure if the one provided by McAfee is really needed. The one thing that McAfee surprising lacks is email protection. McAfee AntiVirus Plus does not scan incoming emails which a lot of other competing AntiVirus programs do. Other McAfee products like their Internet Security suite does along with McAfee Total Protection. This is a big mistake by McAfee and is the reason for our low Protection rating since emails is a large part of how viruses are spread. McAfee AntiVirus is excellent at finding infected files by malware and viruses but with their decision for not including email protection is a BIG mistake in our opinion. McAfee AntiVirus is also not cheap when compared to other competing products. Even comparing with their own products like McAfee Total Protection which includes all of McAfee's AntiVirus Plus features and Internet Security features it is almost 50% more expensive. For this reason, along with the lack of email protection we cannot recommend this product. Includes a firewall and excellent file protection for an unlimited number of devices.. Does not include email protection. Cost is high. Firewall is a stripped down version. I bought the key code for Mcafee antivirus on Amazon. Easiest way to do it. You just follow a link to the Mcafee website, enter the activation code, and the program is installed. I have done this on all my laptops without any issues. My kids are getting old enough now that they want to use the laptop. I have setup Windows 10 for Families and was hoping the virus scanner would have a few extra to help parents. Not a huge issue right now as they are just starting to use the laptop for school but in the next few years I may have to fine something else like Mcafee total protection. Best price I found for this software was on Amazon.com. As of 2016-06-15 you can save $45. It only costs $14.99 for unlimited devices. Great price on Amazon. Protects unlimited devices. Well I should be virus free for another year. My laptop and PC are happy and healthy. You can beat the price and the brand name. I remember using McAfee in the late 80's on my old IBM desktop with monochrome color, and I still use their software today, a lot has changed with computers but my choice of antivirus software has not. The main thing I need to stress to people new to McAfee is make sure you uninstall your old antivirus software first. Nothing gets you in trouble faster than leaving old security software running while you try to install your new software. The best bet is to go to your old antivirus software website and download the appropriate software removal tool. I have had to fix many a computer this way as the actual uninstall program that comes with the program still leaves some software and settings on your PC. I know Norton, Panda and Bitdefender all come with software removal tools. Any legitimate antivirus company should have one. My laptop had a year free subscription to McAfee AntiVirus. I am 10 months into my subscription so I just did some checking around to see what the cost is and if there is a better option. After a few hours of reading it looks like I will be sticking with McAfee as overall I am happy with it as it has kept my computer safe. Obviously there are other virus scanners out their and they may work well but with the coupon I was sent to renew my subscription with, the McAfee price can't be beat. Plus I don't have to install new software, learn about it, and worry if it works or not. I am not an "anti virus" expert but as far as with my PC is concerned Mcafee's anti virus (the 2016 edition one) has worked out very well for me. I purchased the subscription on their website and it just took a couple of seconds to download. I first had to remove my old anti virus program. I was using the one which comes with Windows 10 by Microsoft. once that was done I installed Mcafee and then entered my registration and license information. That was it. My PC has been protected ever since and it has blocked several websites already that contained malware. I even find myself using the file shredder which comes with it to permanently delete the my files. It is very handy which I wasn't expecting to initially use. Fast and easy to install. Has worked without any problems.